Food security remains a major humanitarian concern in 2018 in multiple contexts. 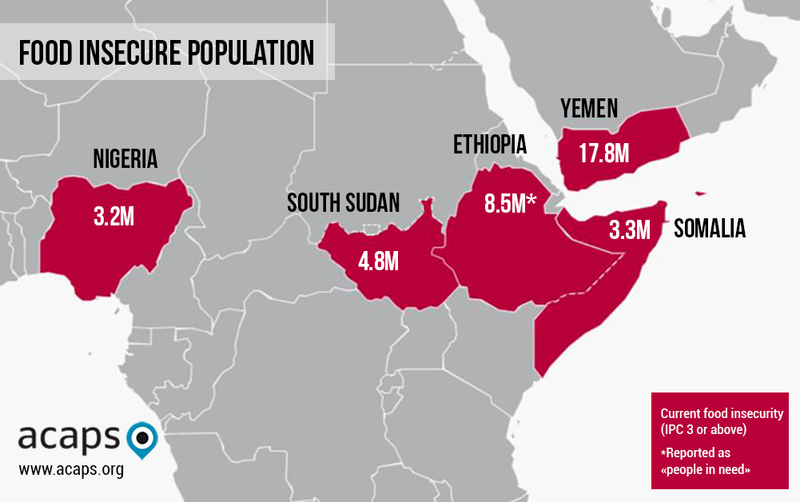 ACAPS has highlighted five of the worst affected countries, where large populations are food insecure, and where households and areas are either already in Catastrophe or Famine levels of food insecurity (IPC Phase 5), or are at risk of deteriorating into this situation. • The estimated food insecure population increased from 5.6 million in December 2016 to 8.5 million in August 2017. • Somali region in the southeast was the most affected in 2017 and is likely to be most affected in 2018. • Prolonged drought conditions following consecutive poor rains since October 2016 are a key driver of food insecurity. • Fall armyworm outbreak spread from the south in April 2017 to affect large parts of the country: between 10% and 30% of crops were affected. • Over 80% of Ethiopia relies on agriculture and livestock as their primary source of food and income. • Ongoing conflict in border areas between Oromia and Somali regions since early September 2017 is further aggravating food insecurity. • The insecurity is also hampering access to food for people who are reliant on humanitarian assistance. • From October to December 2017, 3.2 million people in northeast Nigeria were in IPC Phase 3 or worse. • Most of those in IPC Phase 3 levels are in Borno, the state worst-affected by conflict between Boko Haram and government forces. • Areas beyond the reach of aid actors are thought to be at risk of IPC Phase 5. • Food prices across northern Nigeria are between 30 and 170% higher than the five-year average. • Although food insecurity remains extremely concerning in northeast Nigeria, the situation is better than one year ago. • The number of people in IPC Phase 3 and 4 in January 2018 was 2.7 million, more than double the number a year earlier. • Between November 2016 and the end of January 2018, over one million people had been displaced due to the drought. • Violence and insecurity compound the effects of drought on food security. From January 2017 to the end of January 2018, some 225,000 people were displaced by conflict. • Conflict continues to pose physical and security constraints, which impact on access to food and humanitarian aid. • Zones of concern that are currently in IPC Phase 3 are Addun Pastoral in central Somalia, Guban Pastoral in Somaliland, and Northern Inland Pastoral in Sanaag and Sool. • Current projections estimate that between January and March 2018, 5.1 million people, half the total population of the country, will be in IPC Phase 3 or worse. • Widespread insecurity continues to cause significant displacement, which disrupts livelihood activities and exacerbates food insecurity. • Humanitarian access in increasingly limited. • Poor harvests are of particular concern in the Greater Equatoria region. Armyworm continues to affect crops. • As well as targeting humanitarian aid agencies, both government forces and non-state armed groups are reported to steal food from civilians and deny access to fields. • Food prices are expected to increase again from January and throughout the lean season, and reach higher levels than in 2017. • Pockets of IPC Phase 5 are likely to occur in multiple locations if humanitarian aid is not maintained or scaled up and conflict, weather shocks and economic instability persist. • Some 17.8 million people – 61% of Yemen’s population – were food insecure (IPC Phase 3 or worse) by the end of 2017. • Livehoods and food availability have been highly affected by the blockade by air, land, and sea imposed by Saudi Arabia and its allies since 2015. • Yemen is also affected by nutrition and health crises: some 1.8 million children and 1.1 million pregnant or lactating women are currently acutely malnourished. • Access to shops, food reserves and humanitarian assistance has been limited by fighting. • Unless access improves dramatically, food insecurity is likely to get worse, and most conflict affected areas, particularly the south and west coast, are likely to fall into IPC Phase 5.